In late December 2017, Conran and Partners announced the launch of their newest studio – the practice’s first outside the UK – in Hong Kong. Located in the buzzing Central arts hub of PMQ, the studio allows visitors and locals to easily experience new approaches to design in the region and, as Head of Hong Kong Roderick Tong hopes, will add value to the way people live. We caught up with Tong, Senior Partner Tim Bowder-Ridger and Director Tina Norden to talk about their favourite buildings, their dream projects and destinations, and what’s next for their international design practice. Given your expertise in architecture and design, which buildings have made a strong impression on you – apart from your own? TBR: The Hagia Sophia in Istanbul – it has an incredibly emotional atmosphere that took my breath away (despite being almost 1,500 years old) in 1985 and was what made me want to be an architect. And Nezu Museum in Tokyo by Kengo Kuma – a beautifully simple piece of contemporary Japanese architecture, making it seem effortless. A current highlight for me is the Yves Saint Laurent museum in Marrakech by Studio KO – a lovely contextual use of colour and light, very much at ease with itself. TN: It changes all the time. [But] I’m a huge fan of modernist and brutalist architecture, so the Barbican and any number of the wonderful houses constructed in California as part of the Case Study movement always rank highly in my Top 10. My current favourites include the Prada Foundation in Milan by OMA. I was blown away by this campus of buildings and architectural elements; it’s less of a building and more like a woven canvas of experiences that come together to create a very special experience. The second one, very recent and temporary, is this year’s Serpentine Summer Pavilion in London by Frida Escobedo, a considered, quiet and atmospheric piece of architecture that is reminiscent of her native Mexico and uses standard materials inventively and simply to great effect. I wish this one was staying for good! RT: Le Corbusier’s Ronchamp Chapel, France, is a mesmerising experience starting from the moment of getting off the train, walking up the hill and round the periphery of the chapel before finally entering the building to witness the drama of light. It shows concrete at its most emotional. Tadao Ando’s Chichu Art Museum on Naoshima, Japan is a beautiful museum with most of it built underground. I love how the architecture engages with the artwork (or vice versa) from James Turrell and Monet through the journey of shadow and light, coupled with Zen courtyards of different geometric shapes. What’s next for Conran and Partners? What are you currently designing that is particularly special? TBR: In the UK, we have a large number of residential projects underway. Some of these are high-end but we are also involved in large regeneration schemes that are rebuilding neighbourhoods. To be able to contribute to society at this scale is very exciting. In Japan, we also have some high-end residential projects about to start on-site that focus on softening their context, and we are currently completing works on-site at Centre Point Tower in the heart of London. 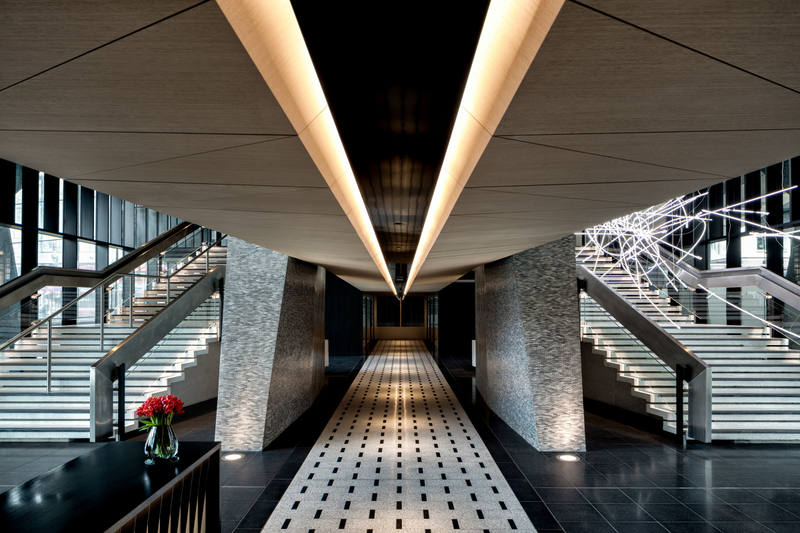 Here we are restoring, altering and converting an iconic 1960s office building into prime residential. This project considers what can be reused in the first instance, and then creates a complete experience internally and externally. We are also in the process of delivering a number of hotel projects across Europe and Asia. TN: We are on-site with two newly built Park Hyatt hotel projects in Asia-Pacific, with MNC Land in Jakarta and Fu Wah in Auckland. We are super excited to see them coming to fruition following the many years the design process for such projects takes. We are also working on a number of individual hotels – urban and retreat – in Europe for boutique operators with one opening imminently – the PURO Kraków Kazimierz. With our Hong Kong studio now in place, we are looking at a number of great opportunities – both hospitality and residential – in the Asia-Pacific region. We have recently started to work on a new project in India with an inspiring and creative client. Closer to home, we are developing a new fitness-studio concept with Jessica Ennis-Hill (2012 Olympic champion in the heptathlon), with the first site likely to be in Central London. Jessica is very inspiring as a person and an athlete and we hope to do her justice! Lastly, what is your dream project or destination to design? TBR: A house in a desert. I would love to deal with the bleak beauty of the environment and a completely different quality of light from the sort we are used to dealing with in urban and vegetated contexts. TN: A dream for any architect is to design their own home. In my case this would be a Mid-Century Modern–inspired bungalow in the desert. However, while I’m saving up for this, I would like to design either a hotel in a fascinating city or else a resort in a fabulous natural destination, with Conran and Partners responsible for both interior and exterior architecture. RT: I’ve always admired Charles Correa’s work and I would say designing low-cost housing which tackles social and economic issues in less developed countries would be fulfilling for me.